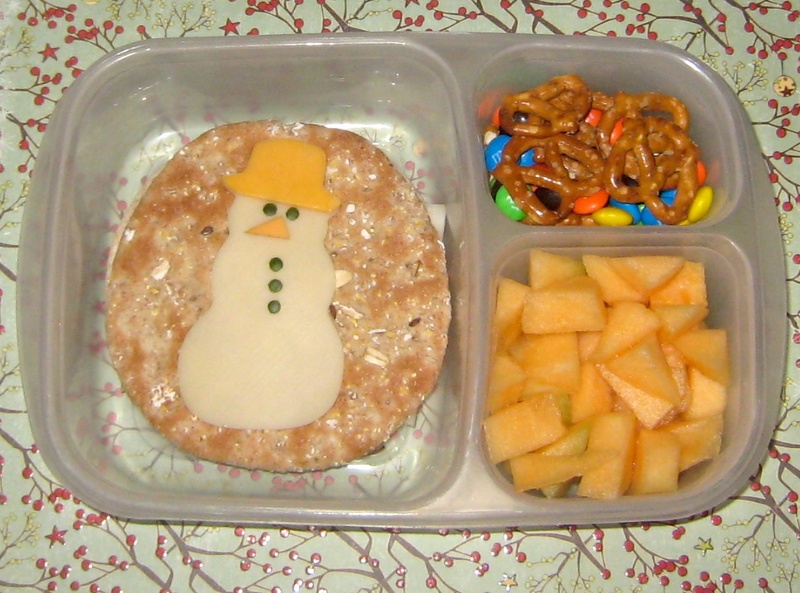 Of course, since Ben had to have a cute Santa bento the other day, I couldn't leave out my girl. She said she would take a Santa too, but it's more fun to have two different themes (which of course means 2 different posts). 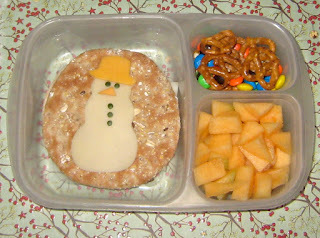 Faith had a similar sandwich to Ben (roast beef), but decorated with a Frosty the Snowman! He's made from swiss cheese, with cheddar hat and nose, and bits of cucumber peel for eyes and buttons. I forgot carrots at the grocery store or he would had had stick arms too. To the right, she has some pretzels and M&Ms trail mix, and cantaloupe, since she doesn't like blackberries. Lunch is packed in our Easy Lunchboxes (also available on Amazon). These are perfect for sandwich creations since there's more space, and Faith (unlike Ben) does not swing her box around. Cute snowman. Now I want one for lunch!